Daggers, darts, and staffs. That was your choice of weapons when you rolled that level 1 mage with 1 hit point and one sleep spell way back when. Many of us chose the dagger or darts (more on darts and spikes another time) because they can be thrown and keep that single hit point out of melee. Unfortunately, in the real world, throwing knives aren’t very effective. It’s hard to get enough force behind the point to get any real penetration, and it’s very hard to get it to hit point first without knowing the distance to the target. I’m not a physicist (maybe a physicist or an engineer can pipe in? ), but it seems that too much energy is lost to angular momentum. And the spin works against you at every turn. The good news is that gamers don’t care. We’ll make it work. 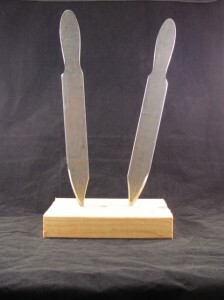 Even better, throwing knives are incredibly easy to make. I start by drawing the pattern on paper and transferring the pattern to Lexan. The Lexan pattern ensures consistency, which is important in a throwing knife. I trace the Lexan pattern onto mild steel bar stock and cut the bar on a band saw. Next, I grind the profile on a belt grinder, followed by the bevels. I use a coarse grit belt, 36 or 40, to “hog” the steel quickly and with as little heat as possible. A quick pass with a 120 grit belt removes the burrs and makes it smooth enough to handle safely. I use mild steel because they don’t need to be hardened; in my opinion, throwing knives shouldn’t be hardened because hardened steel can shatter and throwing knives are subjected to unusual stresses, including being hit by other knives at high velocity. While this leads to faster than normal dulling, we’re not talking about fine cutting tools, and they can be quickly and easily re-sharpened with a file—no special skill required. Throwing knives not only don’t need handle wrap or slabs, they’re better off without them. They will be hit by other knives, and the handles eventually will be destroyed. The knives in the picture and video are 14 inches long and 3/16 inch thick, weigh about a pound, and hit the target with a surprising amount of force. Because throwing knives are so quick and simple to make, and because the materials are so low-priced, I can offer them very inexpensively. Cheap, in fact. I once timed myself making a thrower, and when starting at the grinder with the bar cut and the pattern on the steel, it takes just under five minutes to finish one. But the best part is how much fun they are. With three or four knives and a simple, homemade wooden target, you have hours of fun ahead of you. Ah, thrown weapons, the sad step-sibling of combat activies in the SCA. When I was the local quartermaster, the thrown weapons supplies would see brief flurries of activity for a few months. Then somebody would move, and they would gather dust and rust for awhile. But, man, were they fun when they were active! Yes, they are so much fun. What kind of thrown weapons were in your SCA armory, thorr-kan? We had a dozen or show knives, several throwing axes, and 3-4 spears. There were also a bunch of axe and spearheads without handles. Stranglely, it was easier to get heads than handles, given the number of metalworkers in our group. It’s a shame about the handles; they’re fairly easy to do if you have the right tools. Indeed. I may start bringing them to Friday gaming for something to do while we wait for stragglers. I thought it was going to explain how to throw them? That is what the link from the Kobold email said. This feels kinda like an ad, more than an article. An ad for how to make your own? I’m not sure where the sales part comes in here. Kobold Press doesn’t sell throwing knives. But you’re right, the discussion of how to throw them is missing. Pretty sure Thorr-Kan could fill us in, though.